The story of George Herbert Walker Bush and Barbara Pierce is a love story that lasted decades. 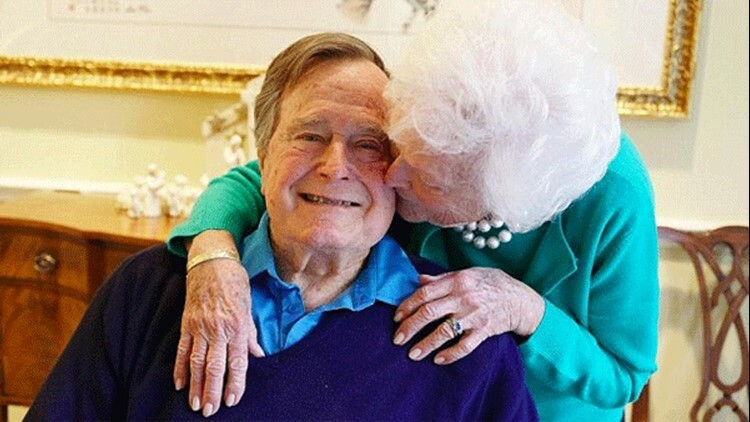 George and Barbara Bush celebrated 73 years of marriage in January 2018. It's a love story found in love letters from World War II and still on display of late on a "kiss cam" at a Texans football game in Houston, where the roving camera captured the former President and First Lady as the crowd cheered them on for a jumbotron-captured public display of affection. Their story began in 1941. He was 17, she was 16 when they met at a school dance. A year and a half later they were engaged. He was on his way to becoming the youngest pilot in the Navy. Their long distance relationship revealed in letters released earlier this year by his presidential library. She called him Poppy. He called her Bar. "I love you, precious; with all my heart," he wrote in a letter from 1943. "And to know that you love me means my life. How often I have thought about the immeasurable joy that will be ours someday." But of the war, he wrote, "It is frightening at times. The seriousness of this is beginning to strike home." And to Poppy, she wrote back, "I really am excited, but scared to death, too. If you hear a big noise up there, don't worry, it's just my knees knocking." It's a love story that nearly ended before it had a chance to start. A year later, he was shot down near the Japanese island of Chi Chi Jima and spent several hours floating in the Pacific before he was rescued by a passing submarine. His two crewmen on board his torpedo bomber died. And the rest of the letters he carried from "Bar" were lost at sea too. They married in 1945, never looked back, and kept on moving. They had six children, including a future president, and a little girl named Robin who died of leukemia at the age of 4. There would be dozens of different homes as Mr. Bush chased their fortunes in the Texas oil business, then the political career that took him from Congress to the UN, to the CIA and the White House, where the love story, obviously endured. "I've loved George Bush almost since the day I laid eyes on him," Barbara Bush said in part of her address to a Republican National Convention audience. Theirs was a love story for the ages.